AB236, the bill that would have legalized lane splitting in Nevada, lost by a landslide last night in the state Senate. There was significant involvement from the Northern Nevada Confederation of Clubs and even some folks from CA, but no visible support from the AMA. Was the AMA involved behind the scenes, and how? If not – why? There’s a perception among some riders and folks in MROs I’ve spoken to in California that the AMA “doesn’t care about lane splitting.” Can you comment on this? With AB236 losing in the Senate and California’s SB350 on hold until next year, what is the AMA’s current stance on lane splitting? One of the primary issues that bedeviled AB236 all through the process, right up to the final vote was a negative perception of riders. Nevada is unique in that they have Street Vibrations every year, but there were a lot of general comments about how motorcyclists behave on the road that indicated a real “image problem.” This has always been an issue, of course, but has resulted in a real loss here. How can we as motorcyclists best solve address this – both the perception issue and the issue of some folks riding like idiots? Any other thoughts on AB236, motorcycle legislation and so on? Historically, the concept of lane splitting has been a regional issue with AMA members and motorcyclists in general. Where it is in widespread practice – California – the AMA endorses the concept and applauds the guidelines recently issued by the California Highway Patrol. While lane splitting may be of interest in certain states, in many states riders have not identified lane splitting as a priority issue. In these cases, AMA members, clubs, and MROs are focusing their limited resources on ending motorcycle-only checkpoints, fighting raids on rider education funds, and defeating universal helmet laws, to name a few. The AMA’s practice at the state level has been to support the efforts of motorcyclists that are consistent with AMA positions. Although the AMA Board of Directors has not adopted a formal position statement on lane splitting, the surge of interest in some states following the CHP’s recent issuance of guidelines has given the AMA board cause to revisit this issue. The AMA staff is currently preparing background information to assist the board with its decision. While the AMA did not advocate openly or work behind the scenes in the case of the Nevada legislation, the AMA agrees with lane-splitting legislation that is not encumbered with conditions that discriminate against motorcyclists, such as rider training or additional insurance requirements. Regarding the negative perception of motorcyclists, the AMA — since its inception in 1924 — has fought these negative perceptions and has strongly advocated responsible use. For example, one of the most pervasive negative perceptions held by the general public concerns the issue of excessive motorcycle sound. AMA President and CEO Rob Dingman said as much in a 2009 interview: “The single greatest threat to motorcycling in America — both on- and off-highway, including ATVs — is excessive exhaust sound.” You can read the complete interview here: http://www.motorcycle-usa.com/669/2468/Motorcycle-Article/AMA-Outlines-Position-on-Sound-Regulations.aspx. The AMA board has also adopted a position statement on excessive sound. You can view it, as well as all of the AMA position statements, at http://www.americanmotorcyclist.com/rights/positionstatements. There is an emerging issue that feeds the public’s negative perception of motorcyclists: “stunting” on public roads, which includes illegal activity by individual riders or groups of riders performing wheelies, stopping traffic, etc. 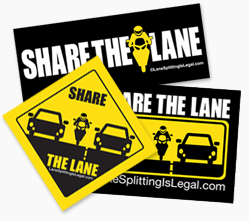 In fact, in states where the practice of lane splitting is not legal, many motorists view lane splitting as stunting. Of note, there are AMA members living in states that do not permit lane splitting that oppose legalizing the practice because they are concerned about reinforcing the negative image of riders held by motorists… some even fear retribution by car and truck drivers. So state-by-state, the legalization of lane splitting faces significant hurdles. With 220,000 members nationwide, the AMA represents a broad cross-section of motorcyclists in America. Yet many of the estimated 9.6 million owners of on- and off-highway motorcycles (Motorcycle Industry Council, 2009) do not belong to the AMA. With increased numbers comes strength, particularly at the legislative and regulatory level, and the AMA is working hard to attract and keep more members. One of the AMA’s newest efforts is the creation of state chapters (see http://www.americanmotorcyclist.com/AMAStateChapters). It is our belief that a strong network of state chapters will not only assist riders with the passage of motorcycle friendly legislation in their states, it will also created a foundation from which to reverse the often negative perception of motorcyclists at the state and local level. The AMA considers lane splitting to be a regional/state issue and members in many states don’t care about lane splitting – some even fear detrimental effects on the perception of motorcyclists in general as a result of lane splitting. However, the AMA endorses the “concept” of lane splitting and applauds the CHP lane splitting guidelines. 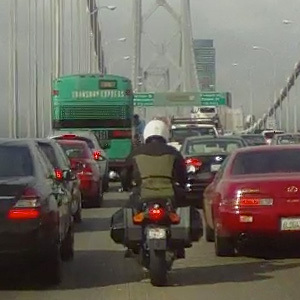 Because of the official CHP support of lane splitting, the AMA is revisiting the issue of lane splitting, and is currently gathering information to inform this decision. The AMA is concerned about negative perception of motorcyclists as a result of things like noise and stunting on public roads. The AMA is working on state chapters, that would presumably be more involved with issues that are important to local riders. Let’s examine these a bit more as a whole. The “state issue” position isn’t new, but I have to imagine (without access to member data) that the large number of riders in California, combined with significant interest in lane splitting demonstrated by legislation in Texas, Nevada and Oregon means that splitting isn’t just a California issue any more. California and Texas together represent a very sizable moto population. The AMA is happy about the CHP guidelines and “agrees with” legislation that doesn’t have too many conditions. On the surface, this makes sense, but not supporting lane splitting legislation that would require additional training (which I haven’t actually seen in any of the proposed bills) is a dubious position. A lot of riders die every year because they lack good riding skills. More training – ignoring for a moment the personal freedom/”you can’t tell me what to do!” thing – is a good thing, not something to quibble about . It’s certainly not discrimination. The AMA seems to generally support rider education – see the AMA positions on helmet laws and rider education – so why call out this hypothetical point of dispute here? The move by the AMA to re-examine splitting is a positive one, and combined with state chapters, could be meaningful, especially given that Texas (where a lane splitting bill very nearly became law) is one of the three pilot states, along with Illinois and New York. Given the size of the moto population in California, it’s unfortunate that California riders weren’t included in the pilot, but New York, Illinois and Texas all have significant urban areas that would benefit from lane splitting. There have even been petitions for NY and Texas already, so perhaps regional interest in lane splitting in these pilot states will be strong and thus influence the AMA’s position on this issue. Negative perception of riders is an ongoing and very troubling issue. In the case of lane splitting, we have a segment of riders who split too fast and don’t stop if they clip someone’s mirror – these are the “lane splitters” drivers remember, not the proficient commute rider. This creates negative sentiment against lane splitting, creating common cries of “He came out of nowhere!” and “He must have been going 90 MPH between cars!” I’ve never heard a driver refer to splitting as stunting, but maybe that’s an exclusively non-California perception. So between stunting, loud pipes and a few motorcyclists riding in a very anti-social way, we’re heaping a fair amount of negative perception on ourselves as a community. We here at LSIL still recommend joining MROs like the AMA and ABATE (I’m a member of both) to help us have a voice. But personally, I’d like my money to go more towards issues I care about – hopefully the state chapters are the beginning of more true regional focus by the AMA.